The halogens are the five non-metals in Group 7 of the Periodic Table – fluorine, chlorine, bromine, iodine and astatine. Astatine is highly radioactive and extremely rare. Form diatomic molecules (containing two atoms). For example Fl2. 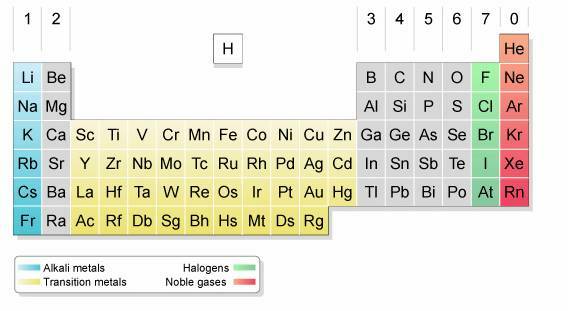 The halogens are among the most reactive elements in the Periodic Table. They all have seven valence electrons – seven electrons in their outer-shell. They react with metals to form compounds called halides. Iron wool bursts into flame as fluorine passes over it – no heating required. Hot iron wool glows, but less brightly, when bromine vapor passes over it. Hot iron wool shows a faint red glow when iodine vapor passes over it. Since halogens have seven electrons in their outer shell, their atoms are only one electron short of a full shell. A halogen atom can gain an electron by accepting an electron from another atom, or sharing an electron with another atom. When reacting with metals, a halogen atom accepts an electron from the metal atom. The metal atom becomes a positive ion and the halogen atom a negative ion. When reacting with hydrogen and other non-metals, the halogen atoms share electrons, forming molecules with covalent bonds. Halogens can also form covalent bonds with each other to give diatomic atoms. This video shows fluorine reacting with different elements. The following video shows a reaction between sodium and chlorine. An Erylmeyer flask is filled will chlorine gas by the reaction of hydrochloric acid and potassium permanganate. Sodium metal is placed into the flask and the reaction is catalyzed when a few drops of water is placed on the sodium metal in the flask. What results is an exothermic reaction that produces a white smoke full of NaCl or sodium chloride dust. The following video shows how iodine reacts with aluminum powder. After a few minutes, the two start reacting to produce a toxic purple cloud of iodine vapor, aluminum iodide, and a little hydrogen iodide.